A wood privacy fence offers a more natural barrier that comes with a less expensive up front cost. 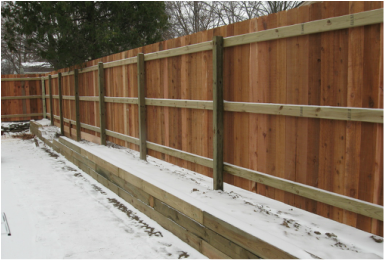 We offer two main types of wood fence; a solid board privacy fence and a "shadowbox" or "board on board" style of fence. We generally stick build these from 4" x 4" treated posts, 2" x 4" stringers, and either 1" x 6" x 6' high treated pickets or 1" x 6" x 6' high cedar pickets. The pickets can either come with flat tops or dog eared corners. When installing the stringers on a 6' high wood fence, we use three horizontal stringers and whenever possible, the ends of the stringers will be staggered. For example, the top stringer would start off with a full 16' long 2" x 4", the middle stringer would be 8' long, and the bottom stringer would again start off 16' long. This way, when the additional 16' long stringers are added to complete the fence, there are fewer seams directly down one post. This creates strength in the entire fence system. Another advantage to stick building a wood fence is that we are able to follow the basic contours and slopes of the ground while building the fence. If fence sections were to be used on a slope, they need to be "racked" to follow the grade. It is not always possible to get the sections to "rack" enough which in turn makes it necessary to "step" the panels which can create large gaps under the fence at the posts and a very uneven look across the top of the fence. As you can imagine, in these situations, it always looks more natural to have the fence custom stick built on site. One of the disadvantages of a wood fence is the expense over time to maintain the fence. For a wood fence to stand up to the test of time a good water repellant treatment or a stain is advisable and these need to be reapplied from time to time. Another weak point is the post in the ground itself tends to become weak over time and requires replacement. With additional up front costs we can combat the post problem by installing galvanized steel posts in place of the wood 4" x 4". This creates a much stronger fence that can improve the longevity of the fence.